As I am heading for Prague this Thursday I didn’t want to start a bigger project – like quilting the levitating jewel box quilt or starting the twin levitating jewel box quilt. Instead I decided to work on some cushion covers for the lounge – you can never have enough. One is made with EPP hexies and the other is with hst. My first EPP hexie project : using an idea of a modern hexie cushion cover on German Bernina site. The explanation is straight forward and I am very happy with the result. At the moment I have just quilted the top, thinking about a design for the back. As I add the zipper closure to the bottom, I piece both sides of the cushion covers with a nice pattern. The cushion cover size is 20″ x 20″ and I have used fabrics from my Kaffe Fassett stash box. I always like to work with them, the fabrics are so colourful, cheerful and happy. The background fabric is Kona solid in eggshell, nearly the same colour as the backing. For the back of the cushion cover quilt sandwich I always use BOMULL unbleached fabric from IKEA, perfect price and quality balance. The second cushion cover I have made was inspired by Saija from Pomada, pop over to see her beautiful quilts! Once more I have used fabrics from my Kaffe Fassett stash box and the Kona solid in eggshell. Finished size is 18″ x 24″, each finished hst unit is 3″. I want to make the same design for the back side, maybe piece the hst’s a bit larger – like a test size for a possible quilt throw. Both cushion covers are quilted using the walking foot in straight lines following the design. I have used Aurifil mako thread 40/2 in light sand, colour 2000. This is all for this time, happy quilting! I have finally quilted the highland cow – see this post about paper piecing the block. I decided to highlight the hair by quilting each strand separately with variegated quilting thread from King Tut. I have stitched around the face, mouth, nose and horns. So even from the back you can clearly see the cow silhouette. A friend of mine saw a block on the internet and asked me if I could make her a cushion cover using this special block. It was called Double Circle of Geese and is designed by Lynne from Lily’s Quilts. The block is now featured in Modern Blocks book under the name Windmill. I have make the block, next step is quilting. The question is how? Piecing process : I knew that I wanted to use the colourful fabrics from the Alison Glass Sun Print collection to make the outer circle of geese. Once I had the outer parts pieced I got out my solid stash box and selected matching fabrics for the inner circle. So, these are all my quilting news for this time, be happy and keep sewing! This April my sister-in-law and her husband are celebrating their golden wedding. She asked me to make her two quilted placemats to celebrate this special anniversary. I choose a simple wedding ring pattern and I knew that I wanted to use my “new” Liberty London fabrics. The background fabric is from Makower Linen Texture in cream. The pattern template is from Teresa Down Under : Sewn Up, blog post Improvisational Paper Piecing. I traced the middle ring by hand reusing paper with incorrectly printed out templates. Instead of improvisational piecing of the middle ring, I folded the template into six sections. For each placemat I cut 24 squares 2,5″ x 2,5″; distributed the fabric squares into 4 sections and chain pieced the middle ring. The finished placemats are oval shape – this is why I have cut out the concave pieces asymmetrically, adding 2,5″ on one side of the outer ring template. The four blocks are ready to make a placemat. I have decided to finish the placemats without binding, i.e. I have quilted only the top and wadding (no backing fabric) in straight lines using the walking in foot. Since I have really enjoyed making paper piecing patterns, I was looking for some new projects. I found a wonderful photo of a paper pieced highland cow and I knew I want to make it. The pattern is from the book Animal Quilts by Juliet van der Heijden – also know as The Tartankiwi. I must admit all patterns in this book are spectacular, the Highland Cow will not be my last project. Before I started piecing the different block sections, I had to do some homework or preparation. As there are many mane pieces in the pattern, I took out my crayons and coloured first the included colouring page and then the paper pattern pieces. I used once more fabrics from the Sun Prints collection by Alison Glass. The background fabric was an easy choice : a bright turquoise solid. 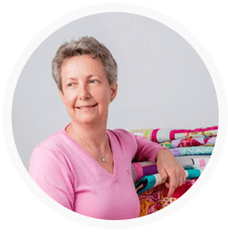 Thread snippets, fabric cuttings and paper – a lot to clean! When I saw bundles of Liberty London fabric in the shop where I had my Bernina serviced, I knew I wanted to try sewing with this soft and pretty material. So I bought my first Tana Lawn cotton fabrics and I am thrilled with the quality and designs. I already have some ideas about projects I want to make with these fabrics. Thanks for visiting and happy quilting! New year – new challenge? Yes, a little bit. I always wanted to make quilt with a diagonal or on point block layout. I decided to use my scraps or small rests of diverse fabric collections and I wanted an easy pattern. I like to work with half square triangles or hourglass blocks, but always used these in a “normal horizontal” layout. The hst got preference! I had strips approx. 4,5″ wide and this determined the hst size. To be on the secure side, I cut my squares for the hst blocks 4″ x 4″, i.e. each hst is 3″ x 3″ finished and the blocks are 6″ x 6″ finished size. The quilt is actually for a chair that the cat uses as his daytime bed. As he didn’t want to pose with the quilt, the dog got photographed instead of him. I have quilted this piece with the walking foot in straight lines following the pattern on the diagonal and horizontal. Backing material is plain cotton calico from IKEA (extraordinary quality and price balance). Because of the diagonal/on point block design, the quilt has turned out bigger than I wanted. But never mind – the cat won’t mind or even notice it! I have used a Kona Cotton solid in Corn Yellow with a matching thread from Mettler Quilting 40 color 500. Nearly the same yellow color as the flower with a busy bee. Happy quilting, until next time enjoy life!